[PDF] Hello! Python | Free eBooks Download - EBOOKEE! Description: Hello! Python fully covers the building blocks of Python programming and gives you a gentle introduction to more advanced topics such as object-oriented programming, functional programming, network programming, and program design. New (or nearly new) programmers will learn most of what they need to know to start using Python immediately. Programmers love Python because it's fast and efficient. Shouldn't learning Python be just the same? Hello! Python starts quickly and simply, with a line of Python code. You'll learn the basics the right way by writing your own programs. Along the way, you'll get a gentle introduction to more advanced concepts and new programming styles.> No experience with Python needed. Exposure to another programming language is helpful but not required. What Makes Hello! Python special Learn Python fast Even if you've never written a line of code before, you'll be writing real Python apps in just an hour or two. Great examples There's something new in every chapter, including games, web programming with Django, databases, and more. 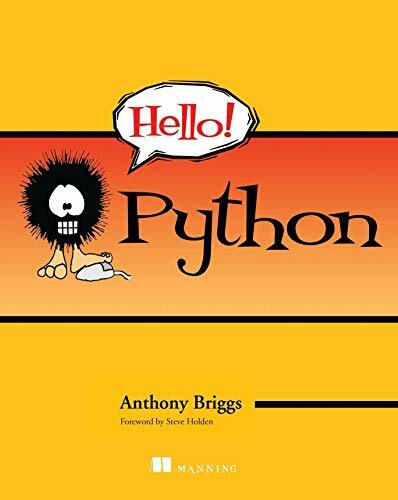 User Friendly guides Using lots of illustrations and a down-to-earth writing style, this book invites you to explore Python along with half-a-dozen travelling companions from the User Friendly cartoon strip. No comments for "[PDF] Hello! Python".